Teaching resources are available in all shapes and sizes, from printed text books to online interactive tools, from video clips to interactive white board activities. Finding up to date resources to support innovative citizenship teaching, which are well designed and age appropriate can be a time consuming job. Busy teachers often ask us to recommend resources that they know they can trust. The new ACT Quality Mark for education resources is designed to meet this need and signpost busy teachers to the best citizenship teaching resources on the market. Each resource that receives the mark will go through a rigorous quality assurance process involving a panel of citizenship experts who review the resource against our quality criteria, the ACT principles for effective citizenship education. 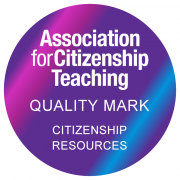 The ACT Quality Mark is our stamp of approval that a citizenship teaching resource is of high quality and educational value. If your organisation produces education resources that support the teaching of citizenship you can apply today. The ACT Quality Mark application process is in two parts. Part 1 is an initial application to ensure your resource is eligible for the ACT Quality Mark. Part 2 is a self evaluation form that you complete to provide us with more detailed information about your resouce and how it addresses the ACT principles of effective citizenship education. You can view the ACT Quality marked resources here. For more detailed information on the application process see Information for applicants.